Time to Celebrate! Armando Manzanero Chichen Itza Concert Live with Fly Cozumel! Never has the phrase “Better late than never” seemed more appropriate than now. That’s because Fly Cozumel is offering round-trip charters to experience the Armando Manzanero tribute concert live at Chichen Itza on February 3rd. For those of you not in the know, Armando Manzanero is one of the most famous and awarded singer and composer in all of Latin America. Born in Merida of Mayan descent, in 2014 he received a Grammy Lifetime Achievement Award. Moreover, world-famous performers such as Frank Sinatra, Andra Bocelli, Tony Bennet, Elvis Presley, Lui Miguel, Ray Conniff, Christina Aguilera and Il Divo, among others, have performed his works. Among his most famous songs are Contigo Aprendí ( With you I Learnt… ), Esta Tarde Vi Llover (“Yesterday I Heard the Rain”), No sé tú (I don’t know if you…), Felicidad (Happiness) and Nada Personal (Nothing Personal). As if that were enough to get your romantic side a movin’ to the UNESCO World Heritage Site that is Chichen Itza, perhaps the line-up will. These great singers will be accompanied by none other than the Typical Orchestra of Yucalpeten and the Folkloric Ballet of Yucatan. Ticket prices for this all-ages show range from 606 MXN to 14,730 MXN and can be purchased online via TicketMaster. The concert will begin at 8:30 p.m.
Do you want to see such class acts as Armando Manzanero, Paquito D’Rivera and Eros Ramazzotti performing in front of the imposing Kukulcan Pyramid at night? Well, our Fly Cozumel crew has clearance, Clarence, and is ready to get you safely, soundly, and in style to the Armando Manzanero concert at Chichen Itza. Flights depart from Cozumel and Playa del Carmen on February 3rd at an agreed upon time. Return flights from Chichen Itza to Cozumel and Playa del Carmen will depart the next day, February 4th, also at a mutually agreed upon time. The cost starts at $299 USD per person ($25 USD airport tax person not included). Concert tickets, accommodations, and ground transportation will not be provided. 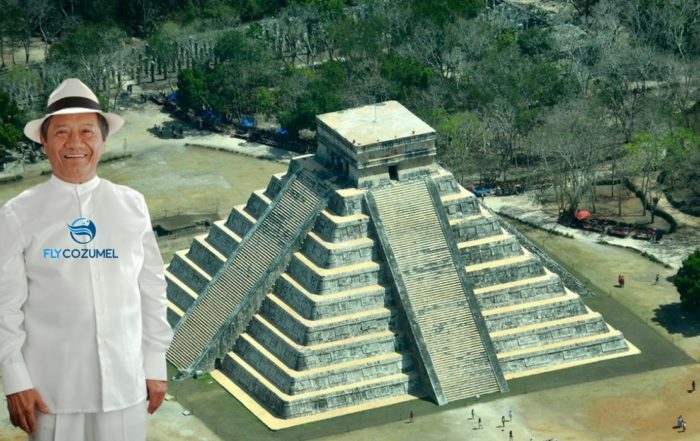 However, taxis will be waiting at the Chichen Itza Airport to take you to your hotel. R.S.V.P. today by filling out the contact form below and our Fly Cozumel crew will get back with you shortly.